This year’s motto is *Beyond Materialism* and the pieces on the wall of all participating artists can be expected multi-faceted at least. So make sure you attend one of the many tour stops worldwide. 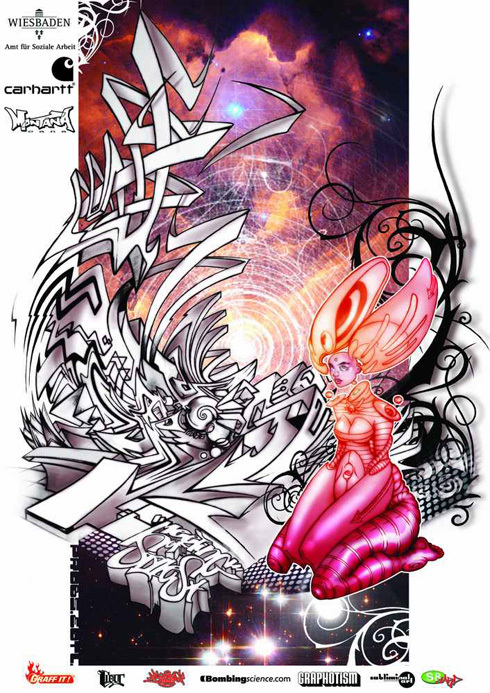 The MOS is an international network of graffiti artists and aficionados that began in Wiesbaden, Germany in 2002. Brought together and inspired by their passion for graffiti, MOS aims to create a forum for the international art community to communicate, assemble, and exchange ideas, works, and skills. In the spirit of cooperation and promotion, MOS has launched over sixty events in sixteen countries across Europe and North America since 2006. These events have sponsored hundreds of graffiti artists from all over the world and throughout the years have attracted more than 100.000 spectators, providing a focal point for urban street culture and graffiti art to reach the larger community.